Geneva, 12 October 2015: Working in close collaboration, the CITES Secretariat and UNEP-WCMC launched today new services to make better use of the information in the CITES Checklist and Species+. These new services allow for better integration of the CITES Checklist and Species+ with national information systems and databases, facilitating the standardized use of species names and Appendix listings and reducing duplication of effort in maintaining these lists. Parties to CITES, Customs officials or others involved in work related to the Convention can now “pull” from the CITES Checklist or Species+ the scientific and common names of the over 35,000 species listed in the Appendices directly into their electronic systems, including national CITES checklists, e-permitting systems or any other electronic system that makes use of CITES information. 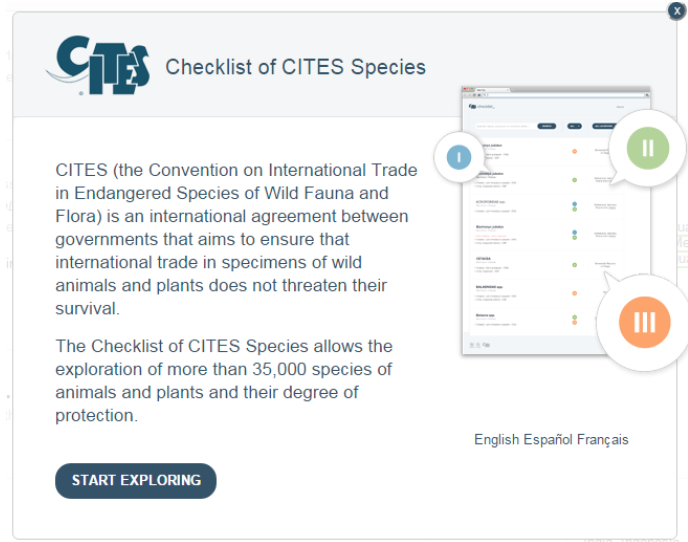 For example, a user can now "pull" from the CITES Checklist the correct scientific name, common name and Appendix of species into electronic permit forms. This will lessen mistakes in using species names and improve permit processing time. Parties can also set the CITES Checklist as their central nomenclature master database and ensure that national CITES species databases have correct listings and are updated following amendments to the Appendices. Finally, information from the CITES Checklist can also contribute to the development of new information systems, particularly those to track and trace CITES species. In his comments on the launch of these new services, John E. Scanlon, CITES Secretary General, said “The availability of these new services to CITES Parties and its community is timely and much needed. Better use of the CITES Checklist will strengthen the CITES business chain by eliminating mistakes and improving the quality of information in CITES permits and certificates”. The Secretariat and UNEP-WCMC are grateful to Belgium, France and Switzerland for their financial support, which made possible the development of this new resource.